SUGIMAT designs and installs thermal oil heaters for CSP plants. Thanks to these heaters, the installation can still be working in case of insufficient solar radiation for the plant’s needs. This heaters can also keep the fluid at an optimum temperature for the proper maintenance of the plant in case that there are unfavourable weather conditions or an extended standstill. SUGIMAT heat exchangers are designed to recover part of the residual heat of exhaust gases, increasing the efficiency of the installation. 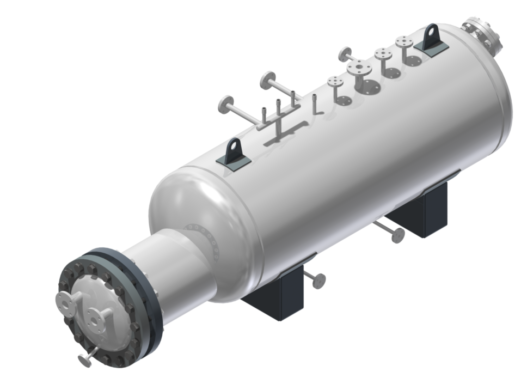 The equipment allow that a heat transfer fluid passes through the heat exchanger, that with hot gases raises up the temperature of air, thermal oil or water. Convection heaters in thermal oil battery (oil preheaters). Steam generators allow to produce steam from thermal oil. For that purpose, the installation has a double inlet: one to introduce water and another one for thermal oil. This last fluid is in charge to raise the temperature of water until it becomes steam after circulating into a tube bundle. The tube bundle is made up by stretched steel seamless U-shaped tubes, cold-form and joint to a base plate. The uses of this equipment are common in the agricultural sector, chemical, wood, food or cork industry, among other applications. Multi-cyclonic gases epurators with plate cyclones and heat recuperation. Its purpose is cleaning the smokes and preheat the air used in the furnace combustion, in order to avoid particles emissions and increase the heater performance. It working is based in the introduction of the gases into the multi-cyclone. Then it is produced a process of rotation and centrifugation in the equipment, with a change in the air direction that goes up by a duct already epurated. This process allows that the particles in the air are stored in the picking up box placed at the lower part and the emissions reduction. These machines help recovering the heat of the exhaust gases to use it to heat the air that will be introduced in the combustion chamber. This enables an increase of heater efficiency. Multicyclonic gases epurators with foundry micro-cyclones with a high efficiency in the particles separation. Their function consists on cleaning the smokes and reduce the particles emission consequently. This equipment works similarly to multicyclons. However, microcyclons facilitate that inlet gases are better distributed between the cyclonic units, therefore epuration is more effective. Cyclonic gases epurators which allow the particles separtion and the gases cleaning, reducing the level emissions. The cyclon, through rotation and gravity, separates the small particles on the air. The mentioned particles are placed at the bottom and the air is recirculated to the upper part of the equipment, after a change of 180º in the flow. So, the expelled air has been epurated and the particles emission to the atmosphere is reduced. Electrostatic precipitators or ESPs are devices which use the ionization in order to get the particles on the air and epurate it after the combustion process. This allows to reduce the air pollution. The working of an ESP consists on the introduction of air into the equipment, where the particles are electrically charged when getting in contact with the electrons from the ionizing electrical field. The charged particles are attracted by the receiving electrodes, stored andsubsequently removed after cleaning. These are highly-efficient machines used in installations with all kind of fuels. This equipment allow the removing of solid particles of a gas stream following after the combustion of biomass with low humidity. Theparticles separation is performed by passing the air through a textile material, where the particles are retained, leaving the air free fromsolid waste.